Right now there are approximately 30 tent camps in the Woodbridge area with hundreds of homeless men and women. Why do they live in tents in the woods? None can afford housing (it is hard to find even a room for rent in this area for less than $1,000 a month). 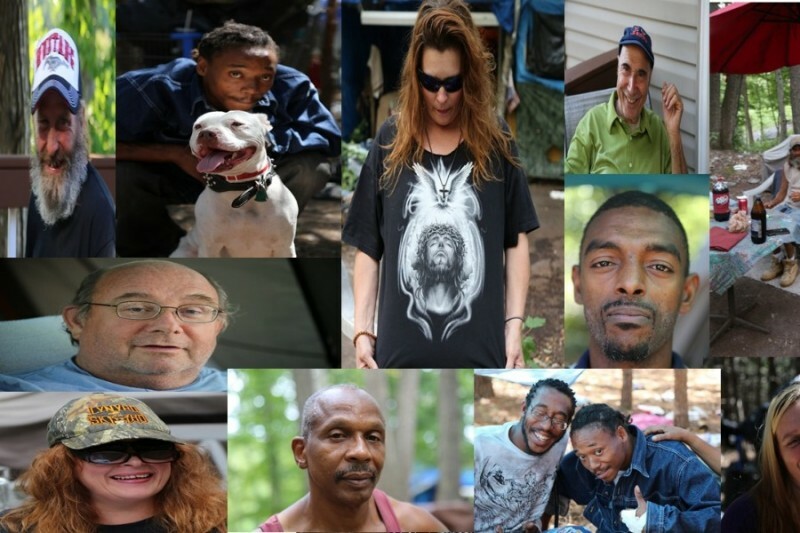 Some have been in homeless shelters, but have reached their maximum stay allowance. A few have pets that they would have to leave behind in order to stay in a shelter. Most cannot find jobs. All are just trying to survive. The funds raised will go to two organizations, the Woodbridge Homeless Outreach and The 25th Project, which provide essentials such as propane tanks (to help alleviate the freezing cold), tarps, coats, socks, RX, dental assistance. The goal is to empower, and encourage our homeless neighbors to take the next steps towards self-sufficiency. Where does the $ go? The 4 main organizations that help the Woodbridge homeless are: Helping Neighbors in Need, Woodbridge Hugs, Woodbridge Homeless Outreach and The 25th Project. Here is a short video in which each group explains what they do. She got married young. They had three children: a girl (5), and two boys (10 and 8). Her husband would beat her, and tell her that he would kill her just like her father killed her mother. He has literally broken her back, and nearly crushed her windpipe. Despite these things, her children live with their father in West Virginia. They have joint custody but she obviously she cannot have the children living in the woods. She cannot contact them as the father changes their phone number, and her daughter and 1 son both just celebrated birthdays in the last 2 weeks. Felisha has diabetes, high blood pressure, hyper thyroidism, asthma, scoliosis, sciatic nerve pain and is bi-polar. She has 15 different medications that she should be taking but doesn’t have the money to buy. Even at her young age she actually had a heart attack last March. She also currently has a kidney infection. This sounds like a made up story but Felisha’s brother also lives in the woods and backs everything said. She needs to be out of the woods. Dwayne was one nine kids growing up in DC. His mother "just didn't like him." As a boy, when his dad went to work, Dwayne would have to go with him and then just sit in the car all day because his mom didn't want him at home. But after his dad left the family, Dwayne had to start taking care of his siblings. So -- at seven years old -- he was already hustling on the streets: dealing drugs and using guns. This led to years of being in and out of juvenile detention/ prison. He eventually got tired of the violence, and went to live in Arlington with his grandmother. It was in Virginia that he found his wife and left his past behind. He told her, "You need to teach me emotion, because with the life I've led I don't have any." And she did. He worked very hard for years on a dairy farm, always showing up half an hour before starting time, just to make sure that he wouldn't be docked for being late. They had a house and cars. All was good. But then his wife fought a battle with cancer, and lost. 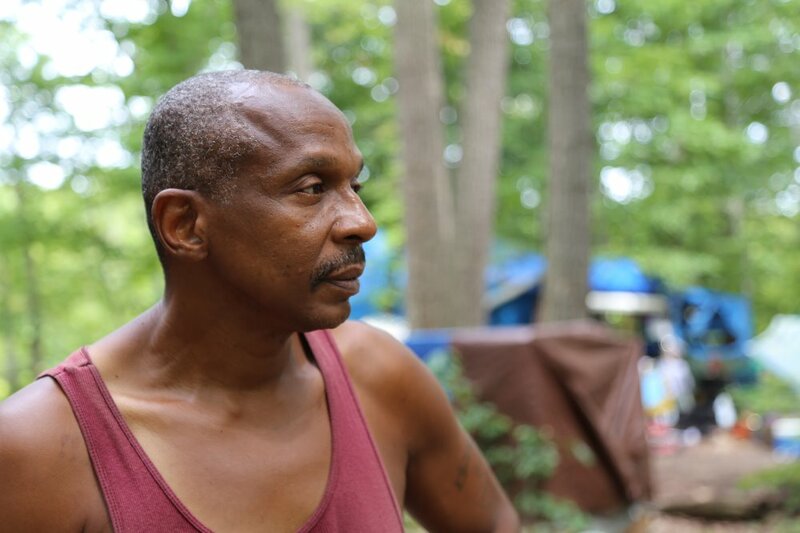 Dwayne contracted Hepatitis B and C, and soon lost his job, which led to losing his home and living in his cars. But eventually they broke down, and he couldn't afford to fix them. He is still fighting insurance for death benefits for his wife, and also his former employer for health benefits, but gets nowhere. So he has resigned himself to the fact that he will live his remaining years in the woods. Because of his sickness, he only eats about once a day and still finds himself up in the middle of the night vomiting, and is in constant pain. I call him the "Mayor of the Woods," as he seems to be the go-to person for everyone around him. He'll do whatever he can to take care of others' problems. He doesn't panhandle, and he doesn't drink or do drugs. But he says a menthol cigarette sure helps him with his nerves. He gets by on the $198/ month he gets in food stamps ($6.50/ day). Allie is pregnant. These first months of pregnancy have been hard on her. She also has a heart problem requiring she take regular medication that costs about $120/ month. 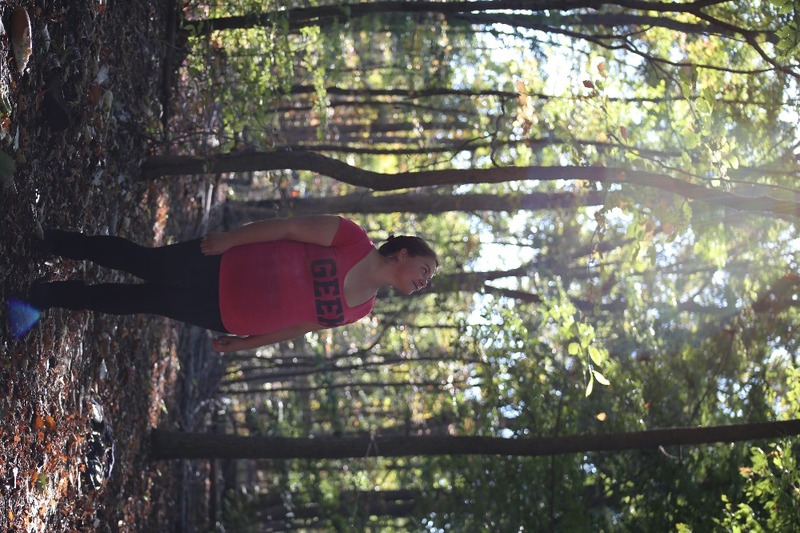 Allie was raped when she was 14, which resulted in her first pregnancy. She wanted to keep her son, but her parents made her give him up for adoption. 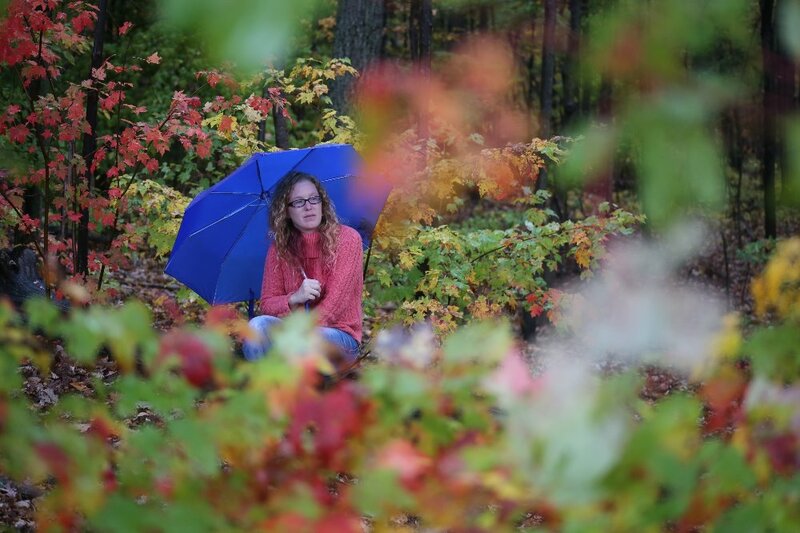 Because of that, her relationship with her parents became strained and she left home at 16. She got married and had three girls (now 9, 7, and 1). She is in the process of getting divorced, and her daughters now live with her parents. Since a set of grandparents also live in her parents' house, there really isn't enough room for her also. 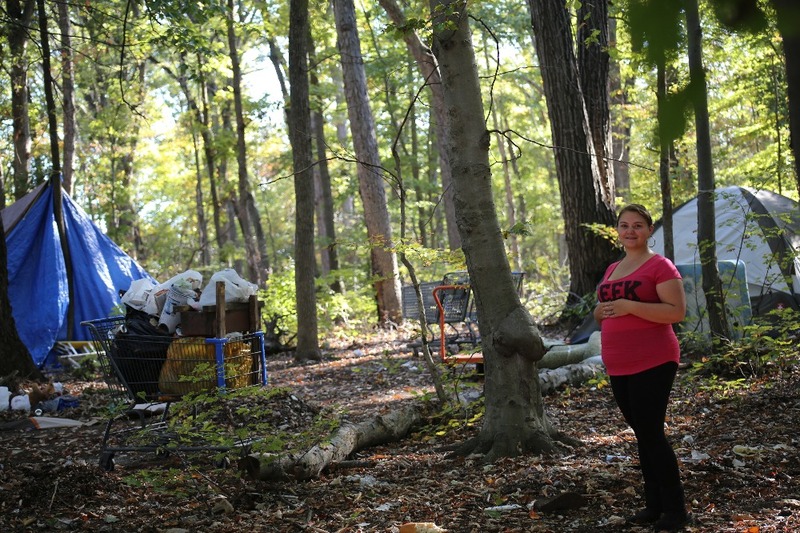 So now she and her boyfriend live in the woods as she is going through her pregnancy. With all that said, she is very strong and she's getting through it all. But it's not easy. Allie should not be in the woods. With your financial help to the cause, you can be a part of getting a roof over her head, instead of a tent. I would want someone to help me get a heater if I were cold and couldn't get one otherwise. Great Effort for such a worthy cause! Thank you! Thanks, Norman, for ALL you do! Hope this helps a little bit! Norman, thank you for all your efforts and for giving others a way to help.